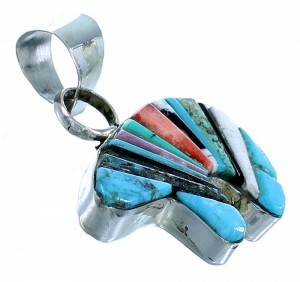 Sterling silver, real Turquoise, Howlite, Jet, along with Red and Purple Oyster Shell. 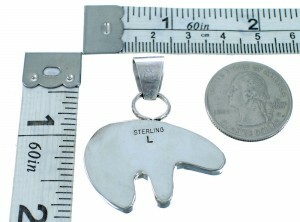 Pendant measures approximately 1-5/8" long (including bail) and 1-3/8" at widest point. If you are looking for elegance and beauty, you have found it! This piece of Native American jewelry is Navajo hand crafted, out of genuine sterling silver and real multicolor cobblestone inlay. 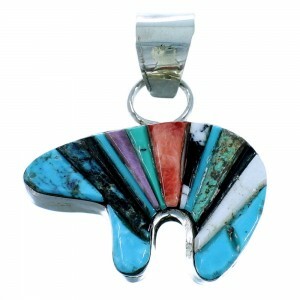 The inlay consists of: Turquoise, Howlite, Jet, along with Red and Purple Oyster Shell. The inlay is carefully set, creating a striking bear design for an exquisite finish. In Native American beliefs, the bear symbolizes physical strength, leadership, and is known as the "first helper". The pendant is stamped steling and hallmarked.